Today, 21th of May, President of Azerbaijan Mr. Ilham Aliyev opened the International Food Industry Exhibition. In addition to representatives from 151 food companies from the whole world, after years was presented the food from Serbia. The company "Zlatiborac" from Machkat reappears in this market, with the goal to continue its expansion from the point, where it was a few years ago. The presence in the neighboring countries (Kazakhstan, Turkmenistan), confirms the correctness of these management decisions. 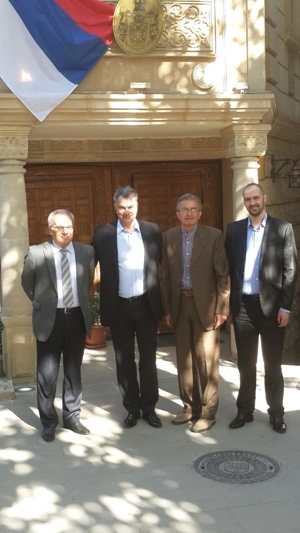 In preparation for his appearance at the exhibition, Dushan Knezevich, General Manager and Tanaskovich Dzordze, Director for export to South Eastern Europe, visited the embassy and had a talk about the need for the realization of the meeting with the holders of state powers and prominent businessmen in Azerbaijan who are responsible for supplying food.